ce of small subgraph configurations in the network and can be interpreted as describing the combinations of local social processes from which a given network emerges. These probability models for networks on a given set of actors allow generalization beyond the restrictive dyadic independence assumption of micro-networks, allowing models to be built from theoretical structural foundations of social behavior. Examples of a random network and a scale-free network. Each graph has 32 nodes and 32 links. Note the "hubs" in the scale-free diagram (on the right). Scale-free networks: A scale-free network is a network whose degree distribution follows a power law, at least asymptotically. 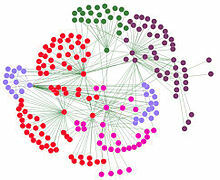 In network theory a scale-free ideal network is a random network with a degree distribution that unravels the size distribution of social groups. Specific characteristics of scale-free networks vary with the theories and analytical tools used to create them, however, in general, scale-free networks have some common characteristics. One notable characteristic in a scale-free network is the relative commonness of vertices with a degree that greatly exceeds the average. The highest-degree nodes are often called "hubs", and may serve specific purposes in their networks, although this depends greatly on the social context. Another general characteristic of scale-free networks is the clustering coefficient distribution, which decreases as the node degree increases. This distribution also follows a power law. The Barabasi model of network evolution shown above is an example of a scale-free network.